While out of town on your sunny holiday, a call comes in from the mayor back home. He's desperate! An evil real estate developer named Big Boss has been destroying crops, stables and buildings in the village...even at your farm! There's only one thing you can do: return to your farm as soon as possible and stop the Big Boss from building ugly parking garages atop your beautiful land! 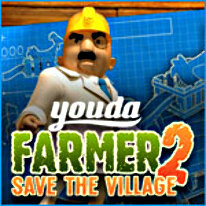 Rebuild the village, earn money, and invest it wisely. Stop Big Boss' evil plans!